Pursuing excellence in the art of engraving began for me at the age of fourteen. Being from Western Massachusetts surrounded by leading manufacturers I was able to request a tour of Smith & Wesson’s engraving department. In 1982 Russ Smith, Paul Piquette and Domingos Joaquim were the factory engravers at Smith & Wesson. Domingos, D.J. as he liked to be called was impressed with my drawings and ambition. He took me under his wing and started teaching from his home techniques and styles of engraving. Early in 1984 I was offered a position with Fountain Plating Co, Inc. hand engraving under D.J.’s direction. We engraved many commemorative level pieces. Soon another engraver was brought in, Thomas Freyburg. Toms instruction in tool making and traditional design was extremely important in this early part of my career. Working for ten years for Fountain Plating Co. Inc. was a fine learning experience helping me mature and learn many aspects of the firearms industry. To this day I am truly grateful for the opportunity Larry Fountain and Mark Fountain gave me as a young man pursuing this fine art. After a decade with the Fountain’s I again turned to Smith & Wesson now under the watchful eye of engraving artist Paul Piquette. This would be the beginning of my freelance career. Almost all my work came from Smith & Wesson. I did start other relationships with U.S. Repeating Arms Co. and Remington Arms Co. But Paul kept me busy with Smith & Wesson’s demand for fine hand engraving. Producing hundreds of engraved pieces in the approximate ten or so years subcontracting for the historic gun manufacturer. 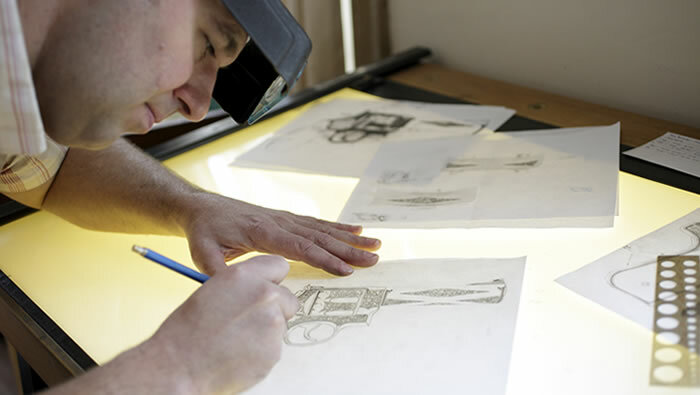 In 2005 a goal of mine was fulfilled I was hired by Smith & Wesson as a factory engraver. A proud time for me personally, in reflecting back to the teenager who so eagerly came to Smith & Wesson over 30 years ago. Working alongside engraver David Misiaszek being overseen by Antonio Melie. The year spent at the factory was rewarding, but I made a personal decision to return to freelance engraving. The following period in my career is one I’m most proud of. Doug Turnbull Restorations offered me the chance to embellish historic period firearms. Studying the pattern’s and styles of the 1800’s and 1900’s gave me the insight to truly respect the artisan and craftsmen of the past. It has been an honor to work with the Turnbull craftsmen these recent years. In closing I must say I have been fortunate for the influences of so many amazing people. Most of all my father and late mother, Dad introducing me to a sportsman’s life in the outdoors. Mom’s artistic talents ,devotion and love which still guides me to this day. In describing my style, I have tried to capture timeless scroll elements. Combining intricate details with tasteful boarder treatments, in all creating a balance of embellishment unique to each piece. My engravings produced are done by hand. Using hammer, chisel and hand pushed gravers. Most all tools are handmade or designed; hand sharpening is done often producing a keen edge which creates clean precise cuts.